As promised last time, here are the elements I've identified that are common to the base rules of five out of six editions of the D&D game. Characters have six Abilities: Strength, Dexterity, Intelligence, Wisdom, Constitution and Charisma. How they are used differs, but their theoretical range is 3 to 18. Characters have levels, and monsters have hit dice, that determine their power. Characters and monsters have Hit Points, that increase with level or power, and which determine how much damage they can take before being taken out of combat. How those Hit Points are determined varies greatly. There are four basic classes, variously named, but most often called Fighter, Magic-User, Cleric and Thief. Two of the editions use race-as-class. Armor Class is a measure of defense. It either goes up from 10 or down from 10 (or 9); but it is usually immediately obvious that an AC over 10 uses the ascending system. Movement rate varies, but is easily scaled; a human's base move per round is 12 (120 feet) in earlier editions and 6 (30 feet) in 3rd edition on. Saving Throws exist to determine whether various dangers affect a being. They use d20 and are of several kinds, but what they are exactly varies. Combat uses d20 to determine hits and various dice to determine damage on a successful hit. As much as I love to use the silver standard, all base sets of D&D have used the gold piece (gp) as base currency. Technically, magic should be on this list. It shares a surprisingly great deal across all but 4th edition. Magic-Users and Clerics have different lists of spells, which are used by expending different spell level slots. Most of the spells from the original D&D have continued on through 3rd Edition. All the same, this is the area with the greatest flexibility, and it certainly would be tough to have to itemize a list of standard spell names. I'm still thinking out a solution for how Standard should refer to spells. Does all this mean you should be playing a game with these rules? No, you can feel free to call Constitution Fortitude, use a different magic system, track specific injuries instead of hit points. But when it comes to producing material for the many people who have taken to playing all kinds of variations on this game, this is the common language. A document produced using only these stats, and using system-free explanations for the rest, will speak to the greatest number of people. A rule set and its supporting documents will be more widely usable across variants of the game the more it builds on this "common language" property. ... So maybe "Original Standard Rules" sounds too much like I'm dictating the play of the game. Maybe just "Original Standard." You can be fully compatible so far as nothing in your game or module contradicts these concepts (for example, you don't split Dexterity into Agility and Finesse). You can be fully compliant so far as all the mechanics in your game use only these concepts. (for example, you don't refer to encumbrance or psionics rules using stats, names and numbers). Some examples using Egg of the Gazolba next time. * spells, like characters and monsters, have power levels. * one branch of magic requires a spell to understand scrolls or other forms of written spell. * you can dispel magic, forcing a spell to end early. Me too. Well done, Roger. This is very important to me. I'm trying to release supplements that are edition neutral, so I spend a lot of time thinking about what I need. 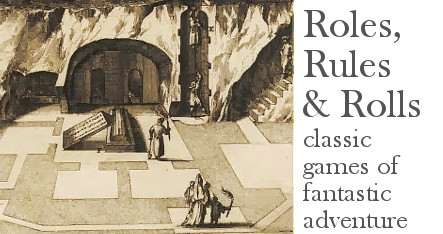 I'm working on alchemy, and if there's one thing that varies between fantasy games, it's skill systems (hence 'OSR Rosetta Stone' on my blog). I'm extremely interested in this series, and am just commenting so you know that this is actual valuable contributions that will affect what I produce. Thanks, I'll do my best and look for your feedback on the project. @Talysman: OD&D and Basic both had race as class, right? Not OD&D. In the LBBs, Dwarves/Halflings are limited to one class, and Elves advance in tow classes (but can choose which to concentrate on.) Supplement I adds thieves and expands multiclass options so that it's basically AD&D. I remember Delta doing some cross-referencing of the OD&D spells and how they appeared (or didn't) in all the editions up to 3E, and their various name changes. That might be a good place to begin work on a 'standard' list.